Christopher Neal Jackson (born September 30, 1975) is an American actor, singer, musician, and composer. He began his career in 1995 starring in the Off-Broadway musical Time and the Wind by composer Galt MacDermot when he was just 20 years old. He made his Broadway debut in 1997 as an ensemble member in the Original Broadway Cast of Disney's The Lion King. He remained with the show for several years, ultimately taking over the role of Simba. He went on to perform leading roles in several more Broadway musicals and plays, including After Midnight, Bronx Bombers, Holler If Ya Hear Me, and Memphis. He drew critical acclaim in several projects with Lin-Manuel Miranda: originating the roles of Benny in In the Heights and George Washington in the smash hit Hamilton. For the latter role he was nominated for a Tony Award for Best Featured Actor in a Musical. He also collaborated with Miranda on the Disney film Moana in which he provides the singing voice of Chief Tui. His other film work includes secondary roles in After.Life and Tracers. Jackson currently stars as Chunk Palmer in the main cast of the CBS television drama Bull. His other television work includes the recurring role of Perry Loftus in the HBO prison drama Oz and guest appearances on Fringe, Gossip Girl, Nurse Jackie, The Good Wife and White Collar. Also active as a film and television composer, he won a Daytime Emmy Award for Outstanding Original Song for "What I Am" for the children's television program Sesame Street. He has also written music for LL Cool J, Sean Kingston, and will.i.am. Born in Metropolis, Illinois and raised in Cairo, Illinois by his mother, Jane Adams, a vocal music teacher and stepfather Herbert Michael Hodges. In 1993 he graduated from Cairo High School. While a student there he performed in plays and was encouraged to pursue a career as an actor by one of his high school teachers, Lynn Steveson, who also led the school's debate team which Jackson was a part of. She also cast him in a production of Arthur Miller's The Crucible. He credits Pilots basketball coach Larry Baldwin and Pastor Larry Potts of Mighty Rivers Regional Worship Center as other important mentors during his growing up years in Cairo. After graduating from high school, Jackson attended the American Musical and Dramatic Academy in New York City. Jackson began his career in 1995 starring in the Off-Broadway musical Time and the Wind by composer Galt MacDermot of Hair fame. He made his Broadway debut in 1997 as an ensemble member and the understudy for Simba in the Original Broadway Cast of The Lion King. He later took over the role of Simba in 2000. He then did work in the theater scenes in Chicago and Minneapolis–Saint Paul, notably earning a BATC Award nomination for Best Actor for Beggar's Holiday in 2004 for and winning a Joseph Jefferson Award (Chicago's equivalent to the Tony Awards) in 2006 for Comfortable Shoes. In 2007 he returned to New York to join the cast of the Off-Broadway musical In the Heights as Benny. The cast won the 2007 Drama Desk Award for Outstanding Ensemble Performance. He continued with the show when it moved to Broadway in 2008. In 2009 Jackson was tapped to write music for the revived children's television program The Electric Company. In 2012 he returned to Broadway as Delray in Memphis, and in 2013 he replaced Everett Bradley as "Diga Diga Doo" in the Broadway musical After Midnight. In 2013 he appeared as Derek Jeter and Bobby Sturges in the Eric Simonson's Off-Broadway play Bronx Bombers as Primary Stages. He remained with the production when in moved to Broadway in 2014. That same year he portrayed Vertus in the short lived Broadway musical Holler If Ya Hear Me which was based on the life of Tupac. In 2015, Jackson originated the role of President George Washington in the musical Hamilton on Broadway. He was nominated for a Tony Award and concluded his run on November 13, 2016. Beginning with the 2016-2017 season, he plays Chunk Palmer in the CBS courtroom drama Bull. Jackson's film and TV work includes Moana, Tracers, The Good Wife, Person of Interest, A Gifted Man, and Nurse Jackie. He is also a member of hip-hop group Freestyle Love Supreme. He has been nominated for three Emmy Awards for composing music and lyrics for television; he won the “Outstanding Original Song” Emmy Award in 2011 for his lyrics to “What I Am,” which he co-wrote for Sesame Street with Bill Sherman. In 2004, after meeting through a production of In the Heights, Jackson married actress and singer Veronica Vazquez. Before the first run-through of the Off-Broadway production of In the Heights, Jackson learned that his son had been diagnosed with autism. Jackson and his wife are advocates for KultureCity: a nonprofit promoting acceptance and inclusion of all individuals regardless of their abilities. KultureCity. They have one son and one daughter. Jackson is 6'0" tall. 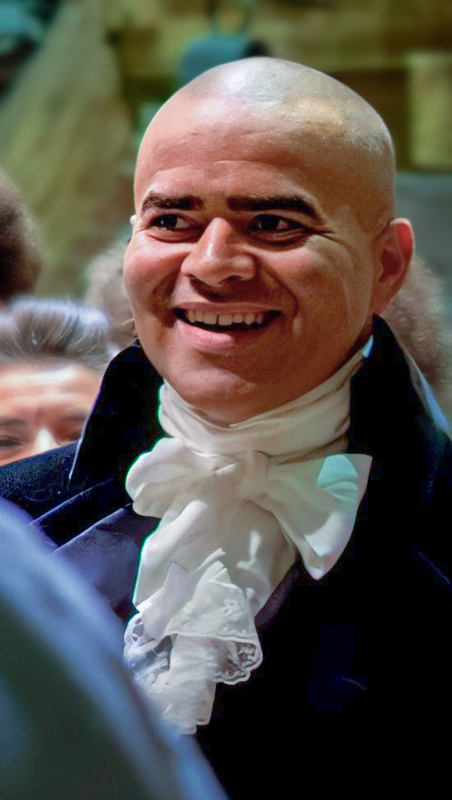 ^ "Christopher Jackson @ChrisisSingin | Twitter". Retrieved November 11, 2016. ^ Daniels, Karu (April 11, 2016). "10 Things You May Not Know: Christopher Jackson of 'Hamilton'". Retrieved November 11, 2016. ^ a b c Cara Racine (March 10, 2015). "Cairo's Christopher Jackson heading to Broadway in 'Hamilton'". The Southern Illinoisan. ^ a b c d e Molly Parker (March 8, 2016). "From Cairo To Broadway: Actor Christopher Jackson clings to his roots as his star rises". The Southern Illinoisan. ^ Daniels, Karu (July 8, 2014). "Broadway Audiences Hear Chris Jackson's Holler: Leading Man Plays Three Starring Roles in One Season". Playbill. Retrieved October 9, 2015. ^ Stephen Holden (August 11, 1995). "Theater Review: Romantic Adventures Of 3 Urban Couples". The New York Times. ^ "On Broadway, Where Actors Get Physical". The New York Times. August 1, 2000. ^ Charles Isherwood (February 9, 2007). "From the Corner Bodega, the Music of Everyday Life". The New York Times. ^ Charles Isherwood (March 10, 2008). "The View From Uptown: American Dreaming to a Latin Beat". The New York Times. ^ Michael Davis (May 12, 2008). "PBS Revives a Show That Shines a Light on Reading". The New York Times. ^ broadwayworld.com. "Christopher Jackson Theatre Credits". Broadway World website. Retrieved September 10, 2015. ^ Gans, Andrew (December 20, 2011). "In the Heights and The Lion King, will join the cast of the Tony-winning Best Musical Memphis". Playbill. Retrieved August 12, 2015. ^ Hetrick, Adam (September 20, 2013). "Primary Stages' Bronx Bombers, Starring Christopher Jackson, Richard Topol and Wendy Makkena, Begins Off-Broadway Sept. 20". Playbill.com. Retrieved February 6, 2014. ^ Hetrick, Adam (October 21, 2013). "Yankees Drama Bronx Bombers Will Transfer to Broadway; Peter Scolari Joins Cast". Playbill.com. Retrieved February 6, 2014. ^ McPhee, Ryan (April 7, 2014). "Saul Williams, Tonya Pinkins & Christopher Jackson to Star in Tupac Shakur Musical Holler If Ya Hear Me". Broadway.com. Retrieved October 9, 2015. ^ Kennedy, Mark (July 17, 2015). "3 presidents in 'Hamilton' put 'blood into the statues'". Lima, Ohio. AP. Retrieved August 12, 2015. ^ Hoch, Danny (April 23, 2015). "Sure, 'Hamilton' Is a Game-Changer, But Whose Game?". American Theatre. Retrieved August 12, 2015. ^ Jordan Crucchiola (October 14, 2016). "Christopher Jackson Is Saying Good-bye to Hamilton". Vulture. Retrieved November 11, 2016. ^ Levin, Gary (November 11, 2016). "A day in the life: Christopher Jackson, from 'Bull' to Broadway's 'Hamilton'". USA Today. Retrieved November 14, 2016. ^ a b freestylelovesupreme.com. "Freestyle Love Supreme - The Crew". Freestyle Love Supreme website. Retrieved September 10, 2015. ^ Kaufman, Joanne (May 5, 2016). "What I Love: Christopher Jackson of 'Hamilton,' at Home in the Bronx". New York Times. Retrieved November 14, 2016. ^ amda.edu. "Alumnus Christopher Jackson nominated for his 3rd Emmy Award!". AMDA blog. Retrieved September 10, 2015. ^ Purcell, Carey (October 9, 2015). "Christopher Jackson On the "Incredible Moments" He's Shared With Lin-Manuel Miranda — Musicals, Marriage and Children". Playbill. Retrieved October 9, 2015. ^ "Chris Jackson height". Retrieved February 3, 2019.